Ayn Rand's first novel is set in post-revolutionary Russia, when "citizen" was the Party-preferred mode of obligatory interpersonal address, as opposed to the subsequent "comrade". Those who believe the former USA has irretrievably turned a corner should consider reading WTL for insights into the coming months and years. And don't feel intimidated by Rand's reputation for voluminous philosophizing. WTL is, as was recommended to me, both a useful entry into her worldview and a terrifying recitation of what life in a nascent Communist regime is like. Best to be learning the origins of the new social compact, especially if you are planning to go Kolchak. 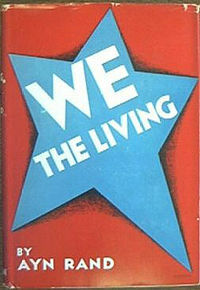 I've read "We The Living" and would recommend thinking about what Solzhenitsyn said about the reality. I found Doctor Zhivago to be very insightful as a preview on what to expect once the Commies are at full strength. But...the Reds had their fair share of atrocities as well. There was no “moral high ground” in the Russian White vs. Red struggle. If the Bolsheviks would have been put down, the “moral high ground” would have, of course, belonged to the whites. The whites lost, and we got the monster known as the Soviet Union, Lenin, and finally Stalin. “Moral High Ground” is defined only after the killing has stopped, by the victor. More accurately, it is defined by the victor when the victor is the only one able to do the killing. Kolchak lost, of course. He was executed in 1920. How many lives would have been ultimately saved if the atrocity-committing Kolchak would have triumphed?